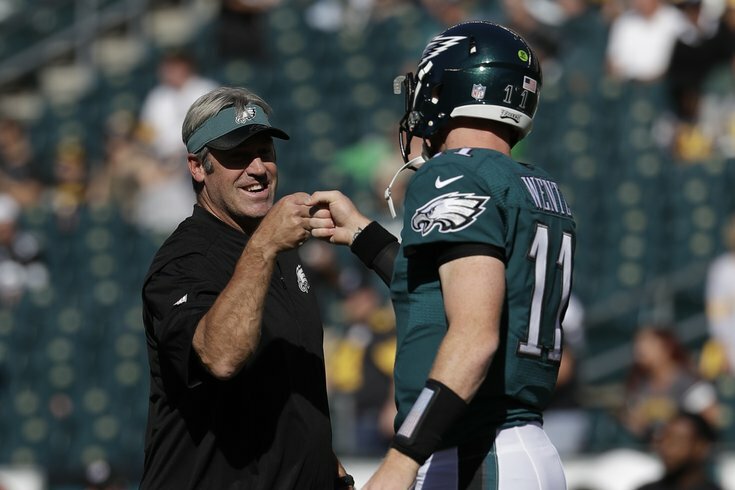 Philadelphia Eagles' Carson Wentz fist bumps head coach Doug Pederson. What the future holds for the Philadelphia Eagles remains to be seen, but it's nearly impossible to argue with the notion that it's looking better now than it did a few years ago. And the 2017 season will be a big one for the Birds, a year in which we should learn quite a bit more about two of the people who could have the greatest impact going forward: quarterback Carson Wentz and head coach Doug Pederson, both of whom are entering their second year on the job. Mailbag: Who do Eagles match up favorably (and unfavorably) with in NFC East? The early returns were promising, and according to the NFL analysts over at ESPN, they feel better about the Eagles' future than they did at this same time last season. They ranked the Birds 19th in their updated NFL Future Power Rankings, five spots ahead of where they were a year ago. But before we get further into the numbers and analysis, it's important to note that these differ from traditional power rankings in that they're looking to identify which teams are best positioned for long-term success rather than which teams are the hottest at the current moment. 100: A+ (Elite), 90: A (Great), 80: B (Very good), 70: C (Average), 60: D (Very bad), 50: F (Disastrous), 40: F- (The worst thing imaginable). That was followed by the team's front office at 78.3, an improvement of 11.6 points from last year. But on the other side of the spectrum: coaching. Pederson had the lowest year-over-year improvement – an improvement nonetheless – and was the only one to receive a below average rating. The Eagles finished five spots ahead of Washington (24th) but are still stuck behind a pair of NFC East rivals – the Cowboys (6th) and the Giants (11th) – after finishing 10th in the conference. I'm not entirely sure how the Giants finished eight spots ahead of the Eagles – if it was regular power rankings I'd be more on board with it. But when it comes to ranking the teams' futures, and the methodology used by ESPN, I don't understand how 57-year-old Eli Manning and second-year head coach Ben McAdoo are that much better than what the Eagles have.